Slotting beautifully into the streets of the stunning town of Sóller, L’Avenida offers an unrivalled combination of sophistication and friendliness. Since the renovation of the 100-year-old mansion, the team at the hotel has pulled out all the stops to provide guests with a unique experience. The mixture of Modernist architecture and chic decoration creates the perfect escape for adults of all ages. 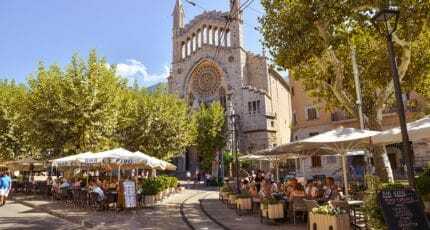 It’s ideally situated close to the main square of Sóller, providing easy access for those wishing to explore the many narrow streets and alleyways filled with hidden treasures. For those wishing to spread their wings further, there is a regular train service to Palma, and tram to Port de Sóller. There are also plenty of options for couples who prefer to stay and take advantage of this piece of Mallorcan history. L’Avenida offers a large range of relaxation and beauty treatments, or you could simply soak up some sun whilst relaxing by the pool. There is a variety of rooms on offer, from luxurious doubles to jaw-dropping suites. We Love…the 400-thread count Egyptian cotton bedlinen. Why you should stay here…hotel has an arrangement where guests can use the Agapanto Restaurant beach facilities – sun loungers and beach bar facilities – at Platja d’en Repic. Good to Know. During winter months, the whole hotel can be rented for exclusive use. We hope you have found this article about L’Avenida Hotel useful and that you have many memorable stays in Mallorca as a result of our recommendations. We hope you have found this article about the L’Avenida Hotel useful and that you have many memorable stays in Mallorca as a result of our recommendations.